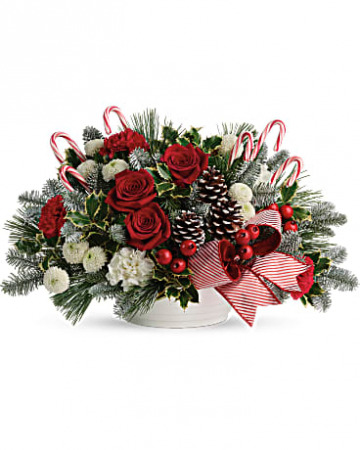 Spread jolly cheer with this magnificent bouquet of Christmas roses and winter greens, accented with playful candy canes and arranged in a classic white bowl. This festive bouquet features red roses, red carnations, white carnations, white button spray chrystanthemums, variegated holly, noble fir, and white pine. Delivered in a Round Dish. Passionately pink! This bouquet boasts hot pink roses and dark red spray roses arranged in our vivaciously violet cube. 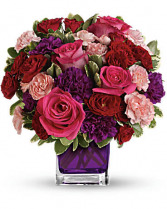 Hot pink roses, dark red spray roses, purple carnations and pink miniature carnations are accented with assorted greens. Delivered in glass violet cube. Throwing a summer soiree at the Hamptons? Planning a wedding on the sand? Or perhaps you just want to send an ocean breeze someone's way. 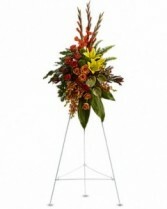 In any event, this tin pail of summer blooms is a beautiful, beachy choice. 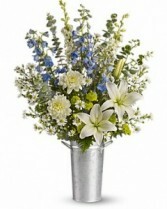 A tin flower pail holds a large spray of white and blue flowers including white asiatic lilies, light blue delphinium, white dahlias, white larkspur, large white monte cassino asters, green button spray chrysanthemums and spiral eucalyptus.